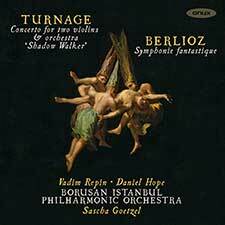 Recorded live in Vienna’s Musikverein, this album captures a special evening which saw the new concerto for 2 violins & orchestra ‘Shadow Walker’ by Mark Anthony Turnage performed by Vadim Repin and Daniel Hope with the Borusan Istanbul Philharmonic under Sascha Goetzel. The second half of the concert was an electrifying Symphony fantastique. "I've been drawn to compose double concertos before, such as Dispelling the Fears for two trumpets, and in Shadow Walker I've again been intrigued by the possibilities of interplay between the two soloists. The idea of shadowing can take many musical forms, such as through canonic writing and the imitation of intervals, though I haven't gone as far as composing a fugue. The string sound of Vadim Repin and Daniel Hope should blend particularly well, almost like two aspects of the same identity. There isn't a strict hierarchical relationship with one violin the shadow of the other - it is much more equal and fluid’ Mark Anthony Turnage.